Well, I have done The Wild Wales Challenge twice before. After each time, I have said never again. I don’t like steep, gnarly hills, and they are de rigueur for WWC. However, they do take you around beautiful parts of North Wales that I would otherwise not get to. When Mark suggested in it in March, it seemed a long way away, at its traditional time of August Bank Holiday Sunday, so I agreed. It was also long enough away from the last time, to fade my memory of the pain, yet remember the spectacular views over the Mawddach Estuary. This year has not been a hard year’s cycling for me, so I did not think I was fit enough for this years challenge, 97 miles and 9000 feet of climbing. So with trepidation the weekend arrives. I was sort of hoping for the usual bank holiday weekend weather, rain, as we had agreed we would not do it if the weather was poor. Well, lo and behold, the weather was set to be OK. There weren’t many Melyd riders at the start, so Mark, Sally and I set off at 8.30 am. Sally left us, when the road started to climb! That first climb was tough, and long. I had descended it before, but never climbed it. The scenery was stunning from this direction, and the descent was good too! Then, it became lumpy; steep short climbs through some forests. I started to think about bailing, as the route crossed the main road back to Bala! However, when we got there the road was very busy, so Mark persuaded me to carry on to the first control point, where we could look at route options! So more climbing, some on the A470, which was unusual for WWC, and very busy. But, what a great fast descent, to the control point, for a welcome rest, drink and cake! Unbeknown to me Mark had warned them, and asked them to persuade me to ride with them! After we all refuelled, we went outside. The sun was shining and Greg made it clear him and Paul would ride with us, at a pace that would help me get round. So, I agreed to try. Paul talked me through it, Greg paced me. Paul has a lot of experience of pacing, having completed the triple ironman last year, and he can talk! Paul was suffering with the heat, so I was climbing faster than him, which psychologically helped me (sorry Paul!). Greg and Mark set a nice pace. Greg said it is only 25 miles to lunch, which didn’t sound a lot, but did take a while, with the continued undulating course! However we were riding through stunning scenery, on quiet lanes, so was living up to what I expected! After lunch, we climbed over a never ending hill! I don’t know if it has a name, but it caused me to have cycling Tourette’s, as bend after bend revealed more hill to climb! Eventually we got to the last control point, nearly at Lake Vrnwy. Another coffee, and cake! I was now feeling happier. I knew the roads we had to cycle to get back to Bala. Round one side of the lake, and up to Bwlch y Groes. Then a fast descent down to Llyn Tegid, and a short ride back. Tactically, I had saved my gel, so had it on the flat road by Lake Vrnwy. Fortunately the last big climb was I remembered it, having done it before. Some steep ramps, with easier sections in between, even some downhill! As I was approaching the junction, which heralds the last steep section before the summit, I saw Mat, Sally, Greg and Mark! Photo opportunity! Wow, what a view. So we all posed for the obligatory selfie, then I set off for the last challenging section of the day, made worse as the road had recently been tar and chipped. It was like wading through treacle! There was a photographer there, if I see the picture it will not be a smile on my face, I was grimacing! The last bit was as thought, easy, knowing the challenge was in the bag. I can honestly say I would not have done it without Greg, Paul and Marks help. As I was cycling I reflected on this, and this ride made me really appreciate being in a club. The support that we offer each other, helps us improve and overcome our fears. As a coach with VC Melyd for women, I try and do this for others, and have been privileged to see lots of new women riders improve and feel confident enough to join our club. I also reflected on a recent article I had read, about how our attitude can affect us, and hold us back. This was certainly the case for me! I looked at the numbers and thought I cant do that! The WWC reminded me of the help and encouragement I have received since being part of this great club. VC Melyd, a great club to be part of! 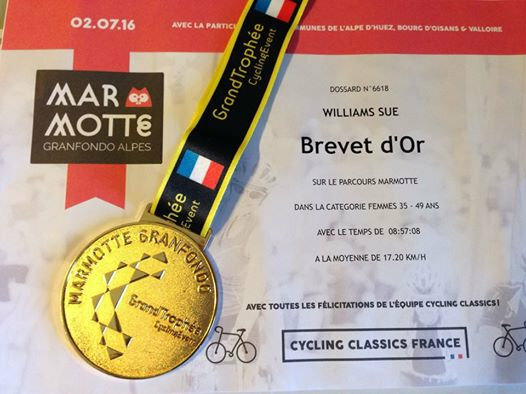 The ‘Marmotte Gran Fondo Alpes’ is frankly a real ball-buster of a ride (even for those of us who don’t have them!) It’s a total of 120 miles with over 17,000ft of climbing taking in 4 of the legendary climbs of the French Alps. The combination of long, relentless mountain climbs, technical descents, and the extremes of alpine weather, makes it impossible to equate this to anything in the UK. – Alpe D’Huez! Finally, with 100 miles of hard riding already in your legs, and nothing left to give, you’ve got to get up Alpe D’Huez to the finish line. 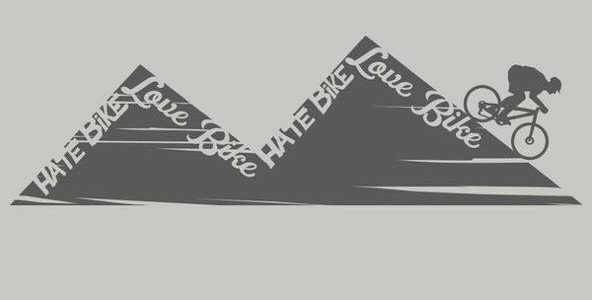 An classic climb, 14km and over 1000m of ascent up the iconic 21 bends and steep gradients, it was a ‘love / hate’ affair as in a fair bit of pain, I dug deeper than I ever have before, to ride continuously to the finish line at the top. 120 miles? Climb the Crimea Pass three times in one ride? Whose silly idea was that then? Ah … that would be mine! Top of the Crimea, and we see the first of the ‘360’ riders starting to climb up from the other side (the sensible ones … who drove over). There is something distinctly masochistic about dropping down the Crimea in the full knowledge that we’re going to have to turn round and climb straight back up again! It’s a full on descent, so although many a Melyd jersey is spotted heading up the hill, only a nod is possible – ‘hands-off the bars waves’ are not really an option at this speed! The “360” isn’t a race or a sportive – there’s no timing chips, no winners, and no prizes. The route is simple – a ‘circumnavigation’ of Snowdon over the Crimea to Betws-y-Coed, up to Capel Curig, round to Beddgelert, and back. For some it’s a significant challenge, and ‘chapeau’ to the many riders who were doing it as their first event or their longest ever ride. For others, it’s a great social ride – a chance to chat with friends and ride with folks from other local clubs. Plus it raises some much appreciated funds for the local Ty Gobaith Children’s Hospice. Rolling back in to Blaenau with tired legs, gazing up at hills knowing I’ve got to climb the Crimea Pass for the 3rd time that day, it’s hard to not give in to the many generous offers of a lift home! Weighted down with a 360 slate momento in my pocket, with a strengthening headwind, it’s a hard slog back up the hill, but the reward is a repeat of the long, fast descent back down to Betws, before bowling back down the valley to home. 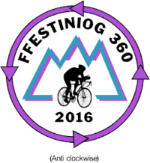 The Ffestiniog 360 2016 is two weeks away. This is a fantastic local event supporting the worthy charity Tŷ Gobeth / Hope House . The event is based, as the name suggests, in Blaenau Ffestiniog – then following a circular route around Snowdon and back to Ffestiniog. This route is around 100km and takes in some amazing scenery. Each year the route direction changes – this year we will be heading out of Ffestiniog and almost immediately up to the Crimea Pass before the sustained descent towards Betws-y-Coed. Check out the Ffestiniog360 website for more information and entry details – and join the local clubs in supporting this worthy charity and great event. “Thanks to YOUR FANTASTIC SUPPORT our little event is growing in stature. The route itself is quite unique. It happens to be exactly 100k which is a bonus. It has something for everyone: fabulous scenery, mountain passes, challenging climbs, long down hills, taking in the famous villages of Betws-y-coed and Beddgelert. Riders can please themselves how they approach the ride. Some may want to go for the record, currently 3hr 15 mins, whilst others will take it steady and even stop for lunch. It’s an easy going friendly challenge for anyone of any ability. Of course our aim is to have a great day out and contribute to a worthy charity. Road bikes, Mountain bikes, Tandems, Recumbents – all are welcome so what are you waiting for? This popular event is back again this year, and will be taking place on Sunday 17th April 2016. The event comes in three formats Bach, Canol, Mawr as well as one aimed at the juniors. Entries are available through the Gran Fondo Conwy website – along with GPX routes, and profiles. This is usually a well attended, and well marshalled event by Always Aim High events – who you will also know from the Etape Eryri (12th June 2016). The Ffestiniog360 is back. Last year it raised an amazing £7,800 for Tŷ Gobaith. The event is scheduled to take place on Sunday 29th May this year. This will be the 5th year of the Ffestiniog360 – and this is a well attended event from local clubs, with last year heading out with two groups. Hopefully we can do the same again this year. ONLINE REGISTRATION is now open… come join us and support an exceptionally worthy local charity. “Almost 500 riders registered for last year’s event. A slightly damp start put off quite a few, however we are still extremely grateful for their support. The sun came out after 11 am and many of us ended up with a tan. Marshalls reported many riders should have gone to Spec Savers as they completely missed the right turn at the Wynnes Arms and went straight on to Llan Ffestiniog. They did happily remember to turn right and get back on route at Maentwrog. This of course meant they avoided one of the most interesting and apparently feared sections of the route. I refer to the minor road which runs parallel to the A496 and the other side of Afon Dwyryd. Despite the heroic efforts of a marshal ushering riders safely onto this road a few chose the horrible A496 instead. We must remind everyone this event is a challenge and part of this challenge is to stick to the route. We know it’s a trade off between a busy dangerous road and the small risk of a puncture but it’s a risk well worth taking. In addition the minor road is steeped in history and natural beauty without a petrol head in sight! We value every rider and what matters most to us is your safety and the money you raise for Ty Gobaith, for which we are extremely grateful. This event is not a race; it is a challenge with a generous time allowance to suit all abilities. Having said that, there were some very good times. 3 hrs 15 minutes seems to be the time to beat if anyone fancies going for it. Apologies for lack of photographs last year but this year we are hoping to have back our fantastic photographer, Alwyn, who produces brilliant work and great action shots. “Ty Gobaith is the sister hospice of Hope House, we care for life threatened and life limited babies, children and young adults from all over North Wales. We have been proud to be the charity of Ffestiniog 360 for the past 4 years, the support that Len and the team give the only children’s hospice in North Wales is second to none. The process is in two phases – with club entries first (the club is issued with login details), and then after that it is the open entry. Phase 1 opens on the 1st of March – and Phase 2 opens 11th April. Entry is £20 and the event is limited to 650 entries. Head over to the wildwaleschallenge.co.uk to find out more. Back at the small end of August three teams of four, and some individuals took part in the London100. This is not news now. As you are riding around, it’s all… well its all a bit big, and the scenery is fabulous… however you are making progress and you miss out on it all. However – as fun as an hours footage of us riding is… for us… it fails to cut it for anyone else. MANY THANKS to (Lord) Gary for cutting this down to something most respectable. Here is to happy memories, and to Team B (Dan Liddle, Gary Sheridan, Vic Manley, Anthony Hogbin) and their great day out.